In an interview with Italian journalist Paolo Luigi Rodari, the author of the blog “Palazzo Apostolico,” Bernard Fellay, the superior general of the Priestly Fraternity of St. Pius X, said the schismatic movement demands not only a “correct interpretation” of Vatican II, but that the Council documents actually be changed. “The reasons are simple,” Fellay said, because “Benedict XVI has liberalized the ancient rite,” yet he has been criticized “by the majority of the bishops.” “What should we do? Re-enter the Church just to be insulted by these people?” he said. “Ratzinger should prepare for a direct revision of the Council texts and not just denounce their incorrect hermeneutic (interpretation),” Fellay went on. He cited as an example the declaration on religious freedom, Dignitatis Humanae. 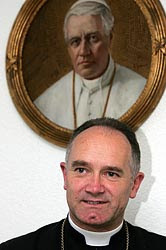 According to Fellay, the document subjects the Church to the authority of the State. “I remain confident, however, because all of our contact up to this point has been excellent,” he said. There are some very strongly held "understandings" in the Church which are sometimes in direct opposition to some others - polarity. We all need to live in patient accommodation with each other. It looks as though Benedict XVI has tried hard to accept the Lefebvrists back into the Church circle, but they do not like the other "understandings" they might encounter there. So, they repudiate the rest of us. Well, assuming they're in good faith, I suppose they are pleasing to God. I'm not sure that they're "invincibly ignorant."